Project/Task title length limit: The maximum length of a Project or Task name. Names that are longer than 20 characters may interfere with page formatting. Show working hours: Whether the ‘Target total’ row should be shown on the TimeSheet web part, and used for colour highlighting on both the TimeSheet and Punchcard web parts. 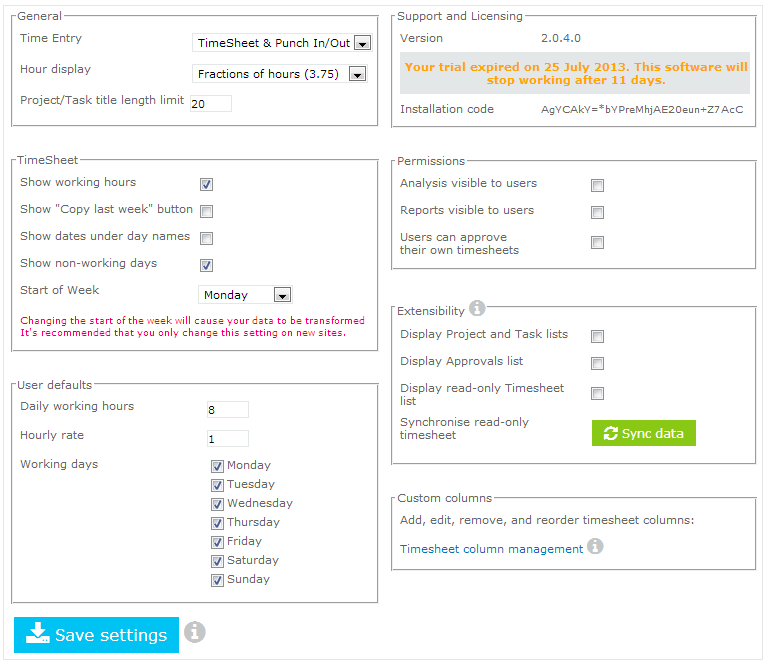 Show non-working days: If enabled, this shows days on the timesheet that are not marked as working days, allowing users to book overtime on days they wouldn't normally work. Start of Week: Changes the starting day of the week. Changing this setting causes all the data in the site to be recalculated. Unless unavoidable, it's advisable to only use this setting on a new site. In this section you can see the current status of your license; in the example the site has an expired trial license. When ordering licenses for TeamTime, you will need to provide the Installation code shown here. For more information of TeamTime's extensibility, see the Extensibility manual page. Each option allows Approvers to view the respective lists through the SharePoint UI. Display Project and Task lists: Allows direct access to the Project and Task lists: See Extensibility: Project and Task lists. Display Approvals list: Displays list Approvals list, which logs all Approve and UnApprove actions: See Extensibility: Approvals. Display read-only timesheet: Displays a read-only copy of TeamTime's core timesheet list. See Extensibility: Timesheets. Synchronise read-only timesheet: Resets any changes that have been made to the read-only timesheet list, ensuring the list data matches the main timesheet list. This allows you to define the labels used for Projects and Tasks on the Timesheet, Punchcard, Analysis, Reports and other areas. It doesn't change the name of the fields in the Extensibility list though, just the UI. The Project/Task prompt allow you to optionally set a prompt for the Project & Task dropdown on the Timesheet if you have enabled the "Use Search on Project/Task dropdowns in Timesheet" option. Otherwise the first Project or Task in the list will be selected by default. The optional locked date will stop all users (including Managers) entering or modifying data for weeks starting before the given date. This is useful particular when Archiving data to ensure that time-sheets are not inadvertently duplicated by users re-entering them.